Lead OAs and OAs: Who are they? 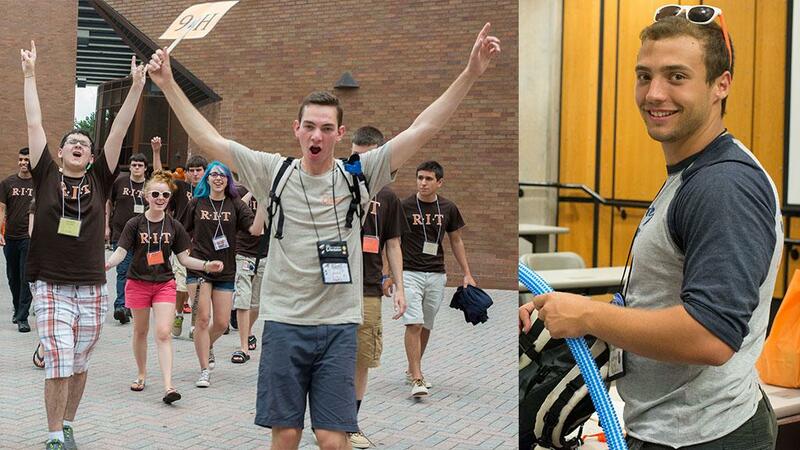 New Student Orientation Week is all about introducing incoming students to RIT. Students have the opportunity to learn about the campus and meet peers through fun activities throughout the week. The Center for Orientation & Transition strives to create a program that will ensure the success of new students and their families into the RIT community. The program creates new and innovative initiatives to help with the transition into college life. Upon acceptance and moving into RIT, new students are assigned into small groups regardless of academic major and interest. These small groups are mentored by an Orientation Assistant (OA). OAs are there to help ease the transition into RIT by guiding the group with ice-breaking activities and teaching them about all the services and resources the campus has to offer. Lead Orientation Assistants (Lead OAs) are also students that dedicate themselves to providing the best orientation experience for new students. About 18 Lead OAs are selected each year, and their main goal is to provide OAs with the necessary leadership and supervision for the program. What's your favorite part about Orientation? "Orientation is fun because you get to dance like a goon, but my favorite part would have to be watching my freshmen bond as a team throughout the week." Advice for incoming students? "College is your chance to create who you truly want to be. Don't hold anything back!" What is the most enjoyable part of Orientation? "Connecting with freshmen and screaming my lungs out! Its also the best part of a new school year." What do you look forward to the most being involved? "I look forward to meeting all of the incoming students and seeing them interact with each other at all of the different events orientation has to offer, and also help OAs with all their duties." Why did you apply for the position? "I love Orientation and wanted to move up to a higher position. I'm really excited to have more responsibilities so I can help out the entire process!" What is the most enjoyable part of Orientation? "Hands down the environment created in that first week. I love helping students through their first part of school and getting them to laugh through the process." Advice for incoming students? "My advice is that you get out of RIT what you put into it. Get involved and you will never be short of valuable experiences socially and professionally." Favorite Orientation event, and why? : "The carnival. Who doesn't love a carnival?!" Ello: In the right place at the right time?